The site isn’t actually illegal as the families of Dale Farm own the land, it is just any building / caravan; to simply describe the site as illegal suggests that they have no right to be there not that planning permission hasn’t been given. Anybody who is welcomed on this site will resist in a peaceful way. Theres been rumours going round that they [trouble makers] have come in and taken over our camp and that’s not the real story. We invited these people here and they are showing us great respect and great support. 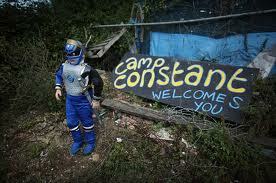 A supporters camp called Camp Constant has been set up by Dale Farm and will be manned 24 hours. It’s all a different situation to the Daily Mail report yesterday. Whilst there is lazy journalism (or clever) to taint the story in order to fan the flames of public fear.